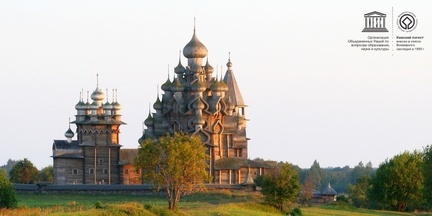 Today the Kizhi museum positions itself in the market of tourist services of Karelia not only as the excursion center of the international tourism on the Kizhi island, but also as sociocultural center of Petrozavodsk which represents the rich culture and history of Karelia in the capital of the republic. In the capital of Karelia there are two exhibition halls and the popular itinerary which passes through the historical and cultural center of Petrozavodsk, connecting the historical buildings restored by the Kizhi museum, which are situated on Kirov square and Fedosovoy street. Every day during all the year in the Exhibition Hall of the Kizhi museum in Petrozavodsk are being presented the exhibitions, devoted to the historical and cultural heritage of this part of Karelia. The themes of the exhibitions change 6 times a year. Also at service of visitors are: videofilm " Kizhi in Pattern of Times ", "Virtual Museum Journeys", the InfoCentre and souvenir shop. Welcome to the Exhibition Hall of the Kizhi museum! A Wi-Fi zone is available in the exhibition hall (wireless Internet is provided by Sampo.ru). The exhibition hall of the Kizhi Museum is equipped with an access ramp. The Lecture and Exhibition Hall of the Kizhi museum is situated in the historical quarter of Petrozavodsk. Exhibitions, which are being changed 6 times a year, various festival and educational programs (including demonstration of traditional crafts) are offered to visitors.